Proline head coach Mujibu Kasule gives instructions to his players. Photo by Shaban Benteke. FOOTBALL–With just over seven days to the start of the Uganda Premier League season Proline are sure they have enough momentum heading into the new campaign after retaining the Phillip Omondi Invitation yesterday. The Mujibu Kasule led team over came KCCA 2-1 in the penultimate fixture thanks to goals from Dan Insiagi and David Owor, meaning they led the final standings with nine points from two games while KCCA FC, the hosts shared last spot with Maroons after managing only two points. Proline have seen notable departures of key players this off season, including former vice captain Gift Ali and Denis Makoba both to Police FC, Savio Kabugo left for trails in South Africa, Yusuf Mukisa (BUL FC) and two contract rebels in Simon Namwanja and Simon Mbazira. With no comfirmed purchases yet, the team, full of youthful players, were expected to be the weeping boys in the tournament but defied the odds on a weekend characterised by individual ball playing skills from several players. 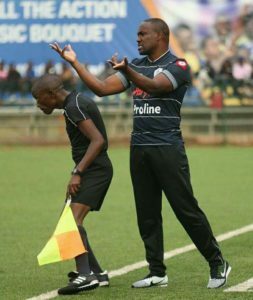 Proline head coach Mujibu Kasule was full of praise for his youthful team. “Coming into the tournament, no one gave us a chance because of the lack of activity in terms of recruitment and the number of players we have lost,” he said. Proline FC players celebrate after winning the Phillip Omondi Invitation tournament yesterday. Photo by Shaban Benteke. “We will definately be announcing new players this week but I am so grateful for what the boys have achieved (winning the Phillip Omondi Invitation tournament) and I assure our fans that we are going to battle on the right side of the table this forth coming season. Proline struggled to beat the drop last season spending the better part of it in the relegation zone but eventually finished with 39 points seven off the drop. The Lugogo-based side will kick-start the new season away to West Nile power house Onduparaka and their first home game comes at the hands of new boys Masavu FC.